I wonder if they'll harass everybody else as well. “The SpaceX company creates the Raptor engine on oxygen and methane components or, as is customary in the Russian classification, the gas-gas scheme. In such schemes, such a pressure level in the combustion chamber is not something extraordinary - in our designs for these schemes we lay down the pressure level in the chamber over 300 atmospheres. And the parameter pressure in the chamber is not the output characteristic of the engine, such as thrust and specific impulse. However, Mr. Musk, not being a technical specialist, does not take into account that the RD-180 engine for the Atlas launch vehicle uses a completely different fuel circuit - “oxygen-kerosene”, and these are other parameters of the engine operation. It is like comparing a diesel and a gasoline internal combustion engine. And if we take into account the fact that Energomash certified the engine with a 10% reserve, then the pressure in the RD-180 combustion chamber is above 280 atmospheres. More hardball playing by Space X when it comes to government contracts. On Twitter he's been saying their plan is basically to put the fuel tank between the crew and the sun. 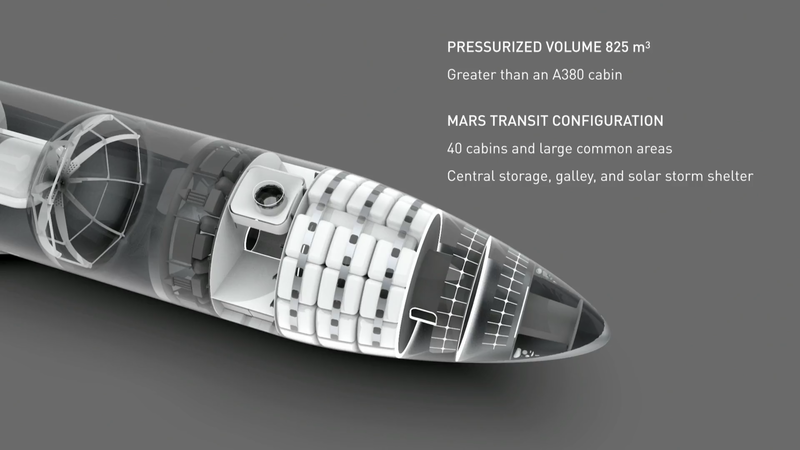 The center of the space ship is meant to act as a shelter of sorts if interior design since BFR hasn't changed too mcuh. Depending on how the inside is partitioned out, that could mean the hull + 1 or 2 interior walls. The U.S. Air Force has divided $739 million in launch contracts between United Launch Alliance and SpaceX for six national security missions slated for 2021-2022. The contracts, awarded under the Evolved Expendable Launch Vehicle (EELV) program, were announced Tuesday evening by Air Force Space and Missile Systems Center. Another fairing catch attempt for tonight's launch. This will also be the 2nd third flight of a Block V booster. A SpaceX Falcon 9 rocket will launch from Cape Canaveral Thursday, carrying a payload of three very different spacecraft: an Indonesian telecommunications satellite, an experimental spacecraft for the US military and the first commercial mission to attempt a landing on the Moon. Falcon is due to lift off from Space Launch Complex 40 (SLC-40) during a 32-minute window that opens at 20:45 Eastern Time (01:45 UTC on Friday). The primary payload for Thursday’s launch is Nusantara Satu, a high-throughput communications satellite that will be operated by Indonesia’s PT Pasifik Satelit Nusantara (PSN), however much attention in the build up to launch has been paid to the Israeli Beresheet spacecraft that is piggy-backing on the Falcon 9 launch.